The O2 Probe, is a cost effective option, offering high reliability, compatibility and accuracy for the measurement of carbon potential (%C) and temperature (°C). It is based on the ZrO2 C-700 electrolyte. This probe measures the oxygen concentration inside the furnace. The Probe construction is robust to withstand harsh environments. Probes are virtually maintenance-free and provide highly accurate control of furnace atmospheres. It incorporates a long life steel sheath especially formulated for carburizing atmospheres. The functional principle of an oxygen probe is based up the comparison of the two oxygen partial pressures in two separate gaseous mediums. The zirconia which represents the measuring element has faults in its crystal structure, i.e. some of the sites which is a typical feature of this ceramic material. Thus, the measuring element becomes conductive. The voltage generated represents a relation between the relative difference of the oxygen concentrations and the temperature of the heat treatment atmosphere. In order to compare the partial pressures, the oxygen probe must be supplied with a gas of a known content of oxygen (ambient air : % o2 = 20.9%) this is what we call reference air. 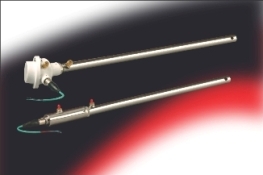 Moreover, the oxygen probe is equipped with a thermocouple allowing measurement of the actual treatment temperature. Thus, the user who knows the CO content either by analysis or by theoretical calculation and who takes into account the values measured by the oxygen probe system is able to determine the carbon potential in the heat treatment atmosphere. The measuring element of an oxygen probe has a limited lifetime. Its surface layer changes depending on the impurities which are found in the heat treatment atmosphere. Therefore the user should replace the measuring element when its impedance exceeds the tolerances admitted. There are two simple tests that can be performed regularly while the probe is in service. If the probe fails either of these two tests, it should be replaced. The impedance of a probe will gradually increase as the probe is used. The impedance of the brand new probe should be measured at the normal operating temperature then at regular intervals, at the same temperature. If the impedance abruptly changes or increases to 10 times more than the initial value, there may be a problem with the probe. While the probe is in use, quickly shut off the reference air supply. The probe output signal gradually fall by a few mV in one minute. If the change is more than 25 mV, the sensor has probably cracked and will give inaccurate readings.